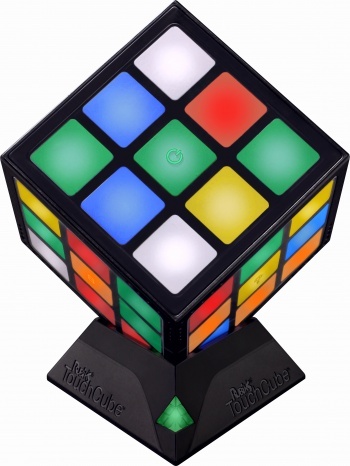 You may be able to get a Rubik's Cube for around $15, but why not pay ten times that much to get an electronic one? The Rubik's TouchCube is based on a cool, yet simple, idea: Take a Rubik's Cube and make it electronic. The device looks nicely built, and ensures that nobody will cheat by just changing the cube's stickers, but is also incredibly expensive with a retail price of $149.99. The cube can do some interesting things, asuuming you find Rubik's Cubes interesting. It mimics the exact behavior of a Rubik's Cube, enabling the rotation of faces with twists and swipes on its touch surfaces. Where the TouchCube differs from its less-expensive version is with an internal processor that can give hints and knows the exact amount of moves it will take at all times to solve it. You can undo moves easily, and while the TouchCube is placed in its charging stand it will solve itself while you watch. The TouchCube also makes sounds, including modern, soothing emissions along with a classic version of the original cube's twist. What confuses me is why anyone would actually want to spend $149.99 on this. The only thing that the Rubik's TouchCube seems to be able to do that an actual Rubik's Cube can't is solve itself, which is valuable but not quite worth the roughly $135 premium over a regular Rubik's Cube that it demands. It might be a nice thing to set on the shelf, but am I the only one seeing this having a hard time selling? It's like a Rubik's Cube for casual Rubik's Cube solvers (if they exist), but with a really big price. I have a feeling that I would put this down after one minute, just like I do with a regular Rubik's Cube. To learn more visit the Rubik's TouchCube official website.